Soft rot occurs mainly in the base and rhizome of calla. The susceptible plants firstly developed soft rot at the base of the stem near the surface, and the disease spread upwards to cause the leaves to wither and die, and the downward development made the rhizome sticky and soft. After the peduncle is ill, the flower turns brown and the peduncle quickly rots. Calla lily soft rot is a bacterial disease, the pathogen is the carrot soft rot, Erwinia carrot soft rot. 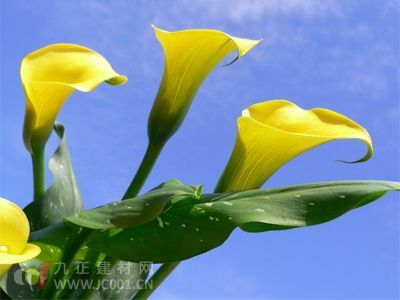 Usually, after 5 parts of the plant start to be yellow, if there is rainwater in the flower pot, the rhizome of the calla is most likely to rot. The bacteria also cause hyacinth soft rot. When excavating the rhizomes, completely remove the severely susceptible rhizomes, or remove the decayed parts, and replace the soil around the diseased plants to reduce the source of infection and control the occurrence of diseases. The diseased soil was watered with 1000 ppm of agricultural streptomycin. Symptoms: Root rot occurs mostly when the calla are nearing flowering. Generally, the lower or outer leaves of the plant are first browned and withered, and the disease continues to develop and spread to the inner leaves. The flower that has been opened has a brownish top, and sometimes the brown can develop to the petiole and peduncle, and the flower is deformed. Pulling up the diseased plant, it can be seen that many roots have rotted, and the remaining roots are water-stained soft rot, leaving only the epidermis and hollow tubular. The disease gradually spreads from the absorbing root to the rhizome, and finally the rhizome is sponge-like dry rot. Calla root rot is caused by infection with Phytophthora infestans. The pathogen survives in the soil and is a kind of hazard transmitted by the soil. The rhizome disinfection completely removes the lesion on the rhizome. After drying, it is immersed in warm water at 50 Â° C for 1 hour, or soaked in 1% peracetic acid solution for 10 minutes before planting. The sterilized rhizomes begin to grow more slowly than untreated, so it is best to plant them half a month earlier. Soil disinfection soil and pots must be heat sterilized before they can be reused. 70% soil bacteria can be used to spray 0.4% soil moisture, but must be treated before planting. Infected leaves produce light brown to yellowish brown lesions, mostly round, oval or irregular. A few diseases have inconspicuous wheel patterns. When the disease develops to the later stage, many small black spotted molds are formed in the center of the lesion, that is, the conidiophore conidia of the pathogen. Calla leaf spot is a fungal disease caused by infection with Alternaria. The pathogen overwinters in the diseased leaf residue of calla, and is spread by airflow. In summer, when the temperature in the shade is high and the humidity is high, the disease spreads extremely fast. The damage is most serious from July to October every year. After entering the end of autumn, the disease gradually decreases and stops developing. However, in the greenhouse, the disease can occur for many years. In winter, when the temperature of the greenhouse is 18-20 Â°C, the disease can continue to develop and spread. These diseased plants become the source of infection of healthy plants. In the case of poor ventilation and poor curing conditions, the incidence is widespread. Strengthening cultivation and management The growing season should be based on the habit of calla, and placed under the shade to make it grow stronger and reduce the incidence. If exposed to direct sunlight, it will weaken the plant growth potential and help the disease. The calla should also be placed in the north in the greenhouse in winter. Rational fertilization to promote plant growth and improve disease resistance. Timely removal of the source of infection and the discovery of diseased leaves in time to clear. Before entering the room in winter, completely remove the diseased leaf debris and concentrate on the treatment to keep the soil surface clean and reduce the source of infection. 3. The common and serious flower buds in the prevention and treatment of pesticides can be sprayed with 50% carbendazim WP 800-1000 times at the beginning of the disease, once every 15 days, generally three times in a row. Leaf mold mainly affects the leaves of calla, and lesions occur mostly at the tip and leaf margin. The smear first begins to lose green and yellow from the tip of the leaf and the edge of the leaf, and then gradually spreads along the vein and forms irregular large spots. When the disease develops to the later stage, a green mold layer is produced on the back of the diseased leaf. Calla leaf mold is caused by the infection of cocci in the fungus. This bacterium is a weak parasite and therefore occurs mostly on senescent leaves. Harmful flowers, fruits and branches on other hosts, such as freesia leaf mold, privet leaf spot, oil palm leaf mold, Wenshulan's flower rot, and silkworm disease. The pathogen is overwintered in the residue of the diseased plant or on the seed by hyphae or hyphae. In the following year, the overwintering bacteria first invade the weak seedlings and become the source of infection until the late growth of the plant to spread and cause harm. Improve plant disease resistance. The pathogen of leaf mold is a weak parasitic bacteria. When the plant grows weak, it is easy to be infected. Therefore, it is necessary to strengthen management, pay attention to hygiene, timely remove the weeds, pay attention to irrigation and drainage, promote the robust growth of plants, and improve disease resistance. It is an important measure to prevent and treat this disease. Seeds of disease-free plants are harvested, and the contaminated seeds are prevented from being used as propagation materials, or are sterilized by using 0.2% carbendazim for 30 minutes before sowing.